Spring is coming and nothing says WASP style like a classic raincoat. It’s been a particularly brutal winter for the howtoWASP and in anticipation of the arrival of spring, warmer, and wetter weather, what better time to feature that all-time WASP wardrobe great: the raincoat. 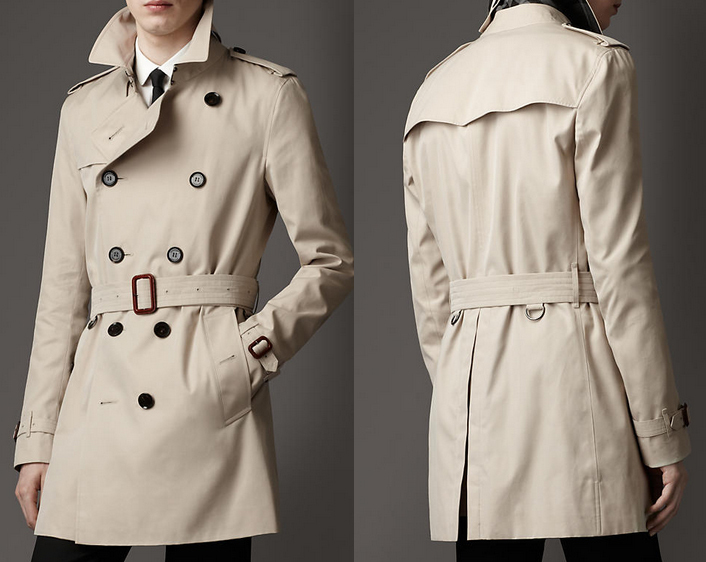 Not just any raincoat, mind you, but the classic Burberry style trench coat. As I’ve often mentioned, one of the great things about WASP fashion is that so few of the trends every go out of style and the raincoat is definitely not an exception to that rule. Here’s a simple test; go look in your grandparent’s closet and see how many of the clothes you’d be willing to wear out today. Since they probably lived through the 60’s, 70’s, and 80’s, the answer will invariably be: not many. However if you’re lucky enough to pull out a Burberry trench coat, you could wear it with pride and not look a bit out of place walking down Madison Avenue. Of course there have been updates to the classic style over the years (more on that later) but the basic raincoat has endured as a fashion icon for more than a century and likely won’t be going anywhere soon. So which is it, a trench coat or a raincoat? Both are technically correct but the former highlights the original purpose for which the coat was designed, and eventually made famous, in the trenches of Europe during World War I. 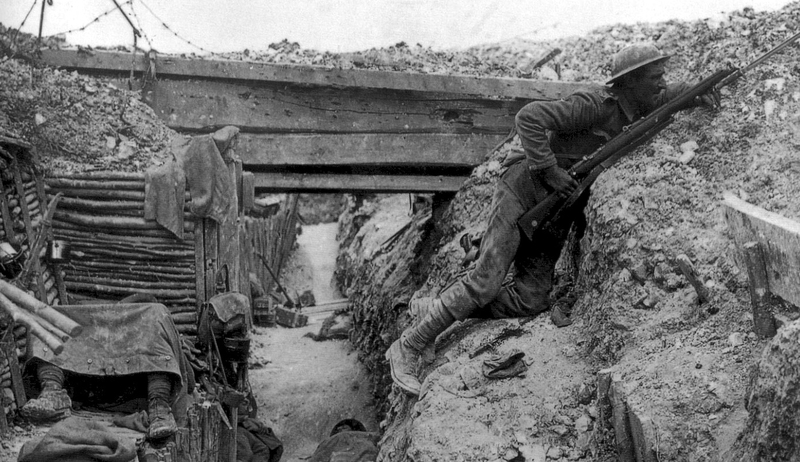 The trenches of Europe during WWI gave birth to the original trench coat. But let’s back up a little first. The true origin of the raincoat began with Thomas Burberry’s invention of a new water repellant fabric he marketed as Gaberdine in 1888. The material was made of a pre-treated worsted wool and cotton blend and tightly woven together to enhance water resistance and durability. Any early example of the original Burberry trench. Many features remain today. Burberry used the material to outfit the great British explorers of the day (including polar pioneers Ronald Amundsen and Ernest Shackleton) but it wasn’t until 1901 when he submitted a design to the Army for a new, lighter weight, officer’s coat that concept of the trench coat was born. Or more correctly, the “military style officer’s raincoat” was born. The term “trench coat” would not become ubiquitous until a decade later with the onset of the first World War. By then the coat had received minor modifications including the addition of several now classic features including shoulder straps for epaulettes, D-rings along the belt to carry equipment, large pockets, and various flaps and vents all designed to aide functionality on the battlefield. After the war, many of the officers returning to civilian life held on to their beloved trench coats and gradually the style became as common on the streets of London as on the battlefields of Europe. 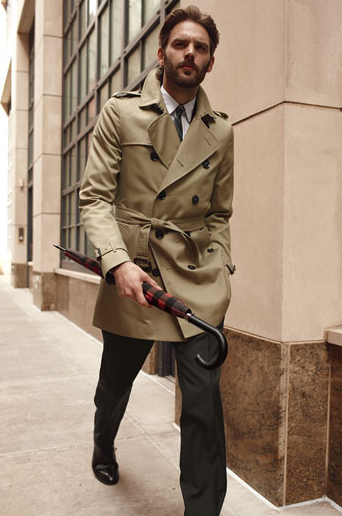 A modern version of the Burberry raincoat, featuring many of the classic elements. Khaki or tan colored gaberdine fabric. Fairly long, with the bottom hitting somewhere around the knees. Double Breasted, button up enclosure. Rain flap over the back of the shoulders. Strap adjustments for the cuffs and sometimes the collar as well. Gun flap over the front of the right shoulder (less common but still a classic feature). Zip-in liner for added warmth. If you’re a true sucker for tradition, then there’s really no other way to go. However, if that all seems like a little too much, there are more modern versions. The best of these manage to look much less conspicuous (fewer straps and military relics, different colors), are easier to wear (single breasted, no belt, shorter length), while still retaining small touches and nods to the classic version. This definitely makes a statement, although probably not one a WASP would comprehend. Ironically, today the company that seems to be pushing the envelope the most when it comes to raincoat styling, is the company that brought us the original: Burberry. While they still do offer some traditional versions, many of their modern interpretations take the concept to the point of bizarre. While the howtoWASP believes everyone is entitled to their own opinion when it comes to style and taste, I would not recommend going that route if the air of WASP’iness is what you seek. And let’s be honest, would you have really made it this far in the post if that wasn’t the case? I thought not. Let’s move on. If money is no object, then your best option is to head over to Saks, Nordstrom, or some other high end retailer and pick up a classically styled Burberry raincoat in khaki. Or, if you’re still not impressed and just can’t bring yourself to buy off the rack, then you could always go the bespoke option for the ultimate in WASP’ish outerwear. 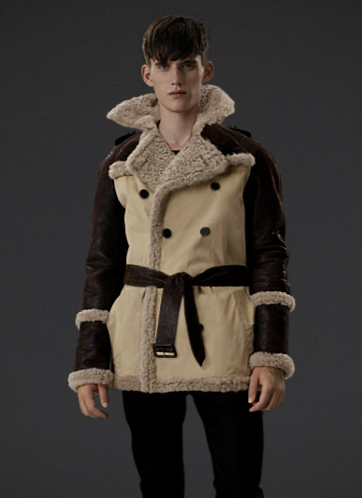 However, if you’re like me and neither have nor want to blow $2,500 on a coat, there are other alternatives. First is to look into other manufactures to see what’s available. Virtually every major clothing brand makes at least one style of raincoat and many can be had for very affordable prices. Quality is going to fluctuate with maker and price, but you could easily pick up a nicely made, classic looking coat for a mere fraction of the cost of the Burberry original at just about any mall in America. No, you won’t get the Burberry check on the inside, but most people will never know the difference. The second option is to go used. The advantage here is that through eBay or some other second hand source you can pick up true Burberry raincoat for for under $100. The obvious downside is that you’ll be at the mercy of what’s available on the market at any given time with respect to size and style. Condition can also vary wildly so be sure to either inspect in the item in person if possible, or request plenty of pictures before committing any of your hard earned dollars. The last thing you want is a stained, ragged, and obviously used looking coat. However a nicely worn (and remember they are meant to be out in the elements) vintage coat can look just as classy and last longer that something bought new in a store. 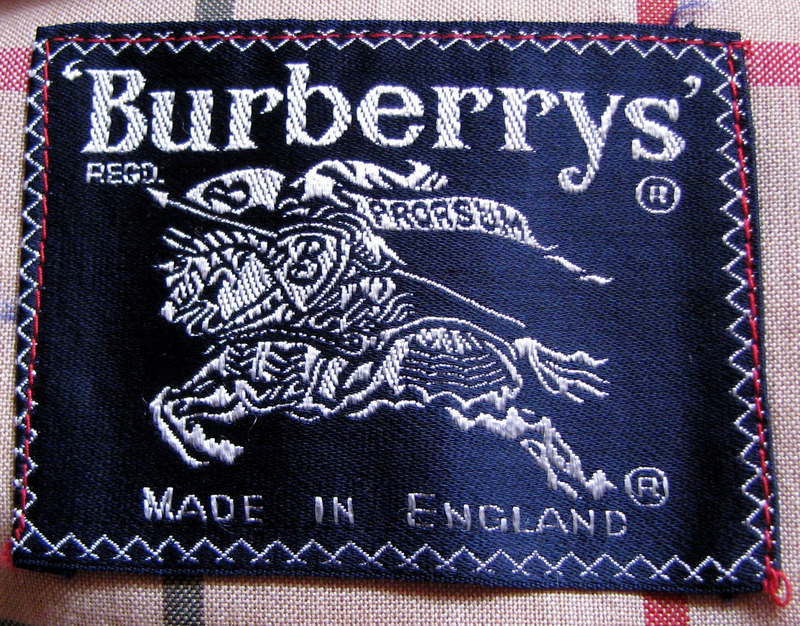 A vintage Burberry label. If you’re buying used, do the research and make sure you can spot a fake. One other word of caution, if going the second route, make sure to become familiar with the features and label of an authentic coat. There are many more counterfeit Burberry items on the market than legitimate ones and it only takes a a little research to pick out the obvious fakes. Option three is to get lucky. Or in other words, find a friend of a relative that has a nice vintage raincoat that they no longer use nor want and is willing to donate it to you. This is the classic grandpa’s closet strategy and unfortunately, more often than not, you’ll come up empty handed. Then again, that’s exactly where my own mother got her Burberry raincoat, so you never know what you might find. Once again, the truly great feature of the raincoat remains it’s versatility. While ideally suited as a topcoat over a suit or other professional wear, it’s equally at home on a casual weekend out. That’s doubly true for today’s more modern versions, which are designed with more casual wear in mind. For me the only real requirement necessary to break mine out is having the right kind of weather. It’s definitely an “in-between” kind of item, at its best during the transitional seasons of spring and fall when it’s too cold for a jacket but too warm for a full on wool overcoat. 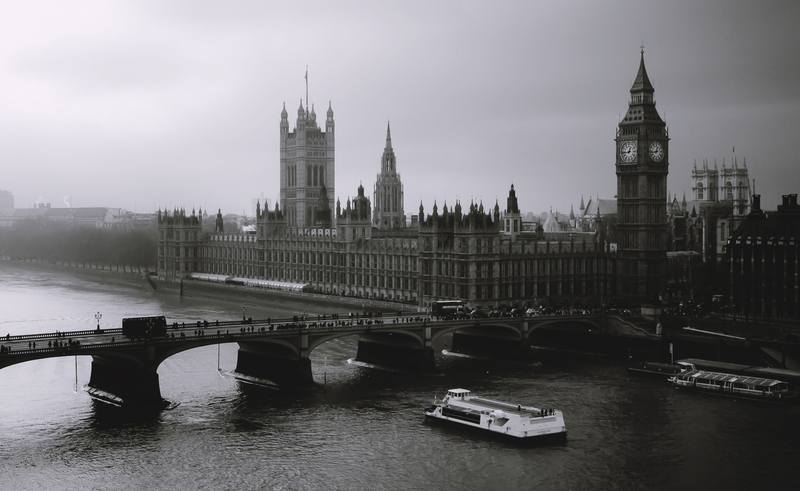 And of course any time you get a cool, damp day (think stereotypical London) there is no better choice. The only real exception is if you find a coat with a good removable liner, which in some cases can pull double duty as a winter coat in less frigid climates. Get yourself one of those and you’ll have truly found a real workhouse of WASP outerwear style. The weather the raincoat was designed for. However that doesn’t mean you can’t enjoy it in the sun as well.